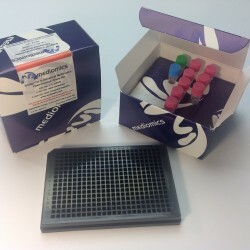 The Mediomics Bridge-It® L-methionine fluorescence assay method is based on a combination of well-established fluorescence measurement techniques and a new assay platform design that utilizes DNA-binding proteins as biosensors for their respective small molecule coregulators (ligands). The affinity of the DNA sequence-specific MetJ methionine repressor protein for its unique DNA binding site is greatly increased in the presence of its ligand, S-adenosyl methionine (SAM). For this assay, the MetJ consensus sequence was split into two approximately equal DNA “half-sites” with one half fragment labeled with fluorescein and the other half fragment labeled with Oyster® 645 fluorophore3,4. The relative amount of SAM present in a test sample will influence the amount of DNA-MetJ protein complex formation in the assay. When this complex forms, it brings the fluorescence labeled-DNA half-sites into close proximity and causes a measurable change (increase) in fluorescence signal emission that can be readily measured using a microplate reader (wavelength settings: absorption 485 nm; emission 665 nm). The Bridge-It® tryptophan fluorescence assay is based on the activity of tryptophan repressor protein (TrpR), a bacterial DNA-binding protein. TrpR protein binds to its DNA-binding site in tryptophan-dependent fashion. 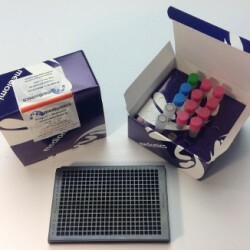 The central feature of this assay design is the TrpR-dependent association of two fluorochrome-labeled DNA half-fragments (one labeled with fluorescein and the other labeled with Oyster® 645 fluophore). 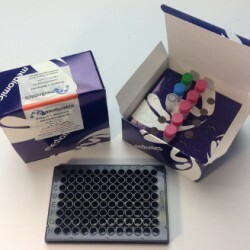 Each fragment contains about one-half of the TrpR protein DNA-binding site. In the presence of L-tryptophan an increase in fluorescence signal can be detected as a result of the tryptophan-dependent association of the labeled DNA half-fragments. 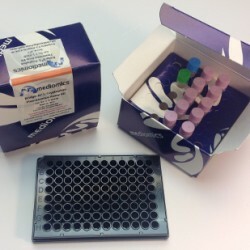 Tryptophan is readily detectable using the Bridge-It® tryptophan fluorescence assay in various types of test samples including bacterial growth medium, brain extract, yeast extract, as well as in human serum and urine. S-adenosyl methionine (also referred to as SAM, SAMe or AdoMet) plays a crucial role in the biological process of methylation in all types of organisms. In the methylation cycle, SAM serves as the donor of the methyl group used in the covalent modification of DNA and proteins. The Bridge-It® SAM fluorescence assay method exhibits highly desirable performance characteristics including a high (>5:1) signal to background (S/B) ratio, a broad linear dynamic range (0.5 µM – 20 µM), and, a detection sensitivity of 0.5 µM. This detection level (0.5 µM) is useful for quantifying SAM in most test samples of interest including biological fluids, cell culture and fermentation medium, and extracts of tissues and cells. 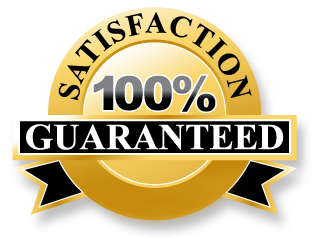 Enter your email address to receive newsletters and promotions.